The South African (SA) National Department of Health (DoH) released new guidelines for the management of HIV/AIDS in April 2010. We discuss here controversial issues and operational challenges in the guidelines; the stimulation of debate and contributing to future guidelines; the timing of initiation of antiretroviral treatment, scope and timing of laboratory monitoring and testing of concomitant conditions, operational challenges such as paediatric HIV treatment and nurse-driven care, and procedures relating to the guidelines such as the need for transparency of the guideline committee and the standard of evidence used to develop the guidelines. We welcome comment and sharing of further insights that will contribute to future guidelines. Our motivation stems from the facts that South Africa's HIV epidemic is not abating; its Millennium Development Goals are not being met; and child and maternal mortality are worse than they were in 1990.1 The Department of Virology of the University of Pretoria convened a meeting of private and public health practitioners in June 2010 to debate the DoH's new antiretroviral treatment (ART) guidelines. Are the goals realistic? Are these 'national' guidelines and do they address private and public health sector needs equally? The goals are laudable, their scope daunting. But are they achievable? According to the spokesperson for the SA National AIDS Council, 'The purpose [of the guidelines] is to bring these into line with international recommendations and ensure the use of more efficacious drugs. '2 How will these goals be implemented and progress and success measured? Guidelines for the public or private sector or both? The guidelines focus on needs of the public health sector, whose huge numbers dwarf private-sector HIV medicine. But both systems must find common ground as health borders are porous. Drugs and tests must be identical or similar. Guidelines should inform and aid integration e.g. when the guidelines do not refer to the use of viral genotyping or baseline hepatitis B screening, does this mean that these tests are unavailable or unnecessary? National guidelines must inform health workers broadly and wisely. International guidelines are referenced throughout and recommendations graded. The panel of experts responsible for drafting the guideline is identified. A guideline must be seen to be objective, truthful, credible and relevant. Since we could not locate information about the panel of experts from the 'guideline' website,3 we question the adequacy of representation from all stakeholders, including the private sector. When should ART be started? Delay in starting ART increases disease-and treatment-related morbidity and costs: the effects of opportunistic disease are more severe, drug toxicity is more frequent, and the immune reconstitution inflammatory syndrome (IRIS) more overwhelming.7-9 IRIS is a particular problem in southern Africa where concomitant infections such as tuberculosis and cryptococcal meningitis are frequent and initiation is late. The guidelines should specifically address the timing of ART initiation in the face of active opportunistic infections and the management of IRIS, including when steroid use is warranted, but is silent on these issues. Late ART initiation is linked to the risk of AIDS-and non-AIDSdefining malignancy,10 drug resistance9 and increased risk of failure to reconstitute the immune system.11 Patients starting ART at CD4 >350 cells/µl are more likely to achieve normal CD4 counts within 4 years of starting treatment. Why would the DoH want to delay the start of ART? Costs and a limited capacity are probable constraints. 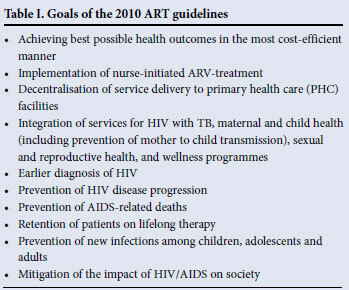 Nevertheless, there are compelling data from cost-effectiveness studies and mathematical modelling that the early start of ART in South Africa can be cost-effective in adults and children, even at levels >350 cells/µl.12 There are caveats: poor adherence, adverse events and loss to follow-up can increase costs and undermine the investment. Increased caseloads would demand more from a tired and demoralised health sector. But few South Africans currently present with CD4 counts >200 cells/ µl. Raising the CD4 bar to 350 cells/µl is unlikely to swamp our HIV clinics. Innovative and supportive handling of this challenge could catalyse improvement of the delivery of care to all South Africans. Statistical modelling shows that earlier treatment would not have had a major impact on the number of patients receiving ART. If patients initiate treatment at a threshold of <200 cells/µl, the number of patients on ART would increase by approximately 233% from roughly 950 000 in 2009 to approximately 3.16 million by 2016. Adoption of the new South African guidelines would result in a further increase of 14%, and the WHO guidelines in only an additional 10% by 2016.13 Some of our poorer neighbours, such as Botswana and Zambia, have already adopted these guidelines, and a few others, such as Malawi, Tanzania and Nigeria, have conducted WHO-supported feasibility studies and announced plans to roll out the new WHO guidelines by mid-2011. Laboratory monitoring: Which tests? How often, if at all? Laboratory monitoring is concerned with the virus, the immune response and toxicity. Insights gained from such monitoring have led to enormous achievements. However, tests are expensive and difficult to regulate, and results frequently ignored. Would money be spent more efficiently on scaling up access to ART? Perhaps with this in mind, can the guidelines significantly reduce baseline and follow-up tests? Will fewer viral loads lead to the impaired management of adherence and resistance? Will less monitoring mean greater delay in diagnosing adverse events? Will this compromise patients' health? Laboratory tests in Africa: are these necessary? The guideline discarded baseline VL monitoring. The first VL is drawn at 6 months on therapy, repeated at 12 months, and thereafter annually. Baseline VL is related to risk of drug resistance and death, progression of disease, occurrence of opportunistic diseases (particularly cancers), and response to therapy.10 When the starting-point of a journey is unknown, progress is difficult to map. After taking ART for 6 months, the VL will be either detectable or undetectable. If undetectable, either the virus is well suppressed, or undetectable from the start i.e. an élite controller, an unusual recombinant form, or a false-positive HIV ELISA. How would one know? 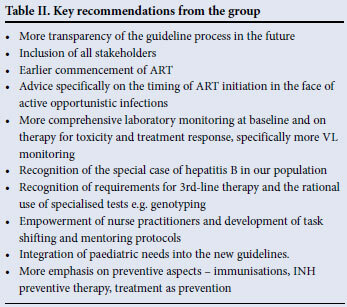 Given the inherent risks of ART - particularly when initiating treatment at advanced stages of infection - the guidelines make little provision for toxicity monitoring. Tenofovir (TDF) has been introduced into first-line therapy. Reliable suppression of both hepatitis B and HIV in those with dual infection, and the maintenance of normal renal function, need mentioning. The prevalence of HIVHBV co-infection in South Africa is estimated to be 6 -17%.17 TDF, FTC and 3TC share activity against HBV, and monotherapy with these, will lead to HBV drug-resistance. Stopping HBV-suppressive therapy i.e. discontinuing TDF/3TC or TDF/FTC, has been associated with severe 'flare-ups' of the underlying hepatitis B.18 ART active against HBV therefore must be continued even if HIV virological failure has occurred. The recommendation that HBV testing is advised before TDF is discontinued lacks emphasis. The guidelines recommend limiting baseline HBV testing to patients with significantly elevated liver transaminases, but a substantial proportion of co-infected patients (84.2% in a South African study) have normal levels at baseline.17 Baseline HBV testing for all may be more prudent. TDF causes renal toxicity as early as 5 weeks19 in 1.5 -2.3% of patients. The 'guidelines' recommend that creatinine clearance is checked at months 3 and 6 and then annually, but earlier monitoring is needed. TDF has also been linked to the development of Fanconi syndrome, yet no electrolyte monitoring is advised. Glucosuria and proteinuria may direct the caregiver to a renal problem, and routine urine dipstix monitoring should be encouraged. The second concern is the lack of liver enzyme monitoring on NVP. ALT testing is only recommended if a rash develops on NVP and, since this is an early occurrence, it will not warn of mid-term or late-onset hepatotoxicity. Liver toxicity rates vary between 0 and 27% and are higher in women. There is significant concern about NVP toxicity since the guidelines recommend the use of NVP in pregnant women with CD4 counts <350 cells/µl. NVP has been avoided in women with nadir CD4 counts >250 cells/µl because of the risk of fatal hepatotoxicity.20 Despite recent studies not confirming this risk,21 we advise caution and more frequent ALT monitoring since deaths have been reported, mostly in the higher CD4 category (>250 cells/µl) and mostly among women. Survival data suggest that 22.5 years, perhaps more, can be added to the life of someone on ART.22 Will current treatments last that long? The weakness of first-line treatment is the low genetic barrier to resistance. Only 1 or 2 key resistance mutations may confer drug resistance to that regimen and to other agents, thereby limiting subsequent treatment options. Early drug failure is a risk, and delay in switching to second-line treatment will also increase the degree of resistance. Therefore, much second-line therapy may effectively be boosted protease inhibitor monotherapy. It will be difficult to know without genotyping, which is expensive, yet is an essential guide in the planning of 'next' therapies. While first- and second-line regimens can remain largely generic for now, third-line and salvage therapies must be tailored to the recipient unless new classes of ARV are made available. The guidelines advise that those failing second-line treatment be referred to a specialist. But there are too few specialists and an alternative plan is needed. Patients and their caregivers will soon demand third-line treatments. Via application to the Medicines Control Council, private-sector patients can access new drugs, which are expensive, and local pricing can only be reviewed (and hopefully reduced) upon registration in this country. Placing these drugs into a planned schedule will start to regulate their use wisely and focus on answers to third-line options. In this regard, the guidelines require closer approximation to international counterparts. With 5.7 million or more HIV-infected individuals in South Africa, doctors alone cannot provide sufficient care. It makes sense for nurses and 'clinical associates' to broaden this base, as in Malawi and Botswana. In a randomised trial (N=812) in South Africa, doctor-managed ART-related care was compared with nurse-managed care.23 Nurses were as good as doctors in providing care. The actively sick were excluded from recruitment, and this study therefore lends support to nurses in the caring of well HIV patients. Doctors would be better used caring for the sick. Of concern was the alarmingly high level of cumulative failure at week 120 - 48% (nurse group) and 44% (doctor group) - which suggests that neither doctors nor nurses intervene adequately to prevent treatment failure, and lends further support to more frequent VL monitoring. Based on VL results, a nurse can give step-up adherence counselling and retest after 1 month. If re-suppression of the virus has not taken place, referral to a doctor is recommended. The role of nurses as caregivers in the HIV epidemic requires clear defining. Health professions councils must provide registration, legal protection and ensure adequate skills. Sick patients will need referral for assessment and care by doctors and, once well, be referred to nurse-level care. Perhaps some nurses will be trained to manage various non-life-threatening medical conditions in the community. But nursing care will only be as good as the next tier of support. At present, the South African public health system shows little evidence of the resilience and goodwill that this venture will demand. The guidelines give no detail in this regard and are also silent on the role of, and guidelines for, clinical mentoring programmes for caregivers. Changes in the paediatric guidelines have brought the private and public sector management of HIV-infected children closer together. Although the Prevention of Mother to Child and Paediatric Treatment guidelines are steps in the right direction, concerns exist about their implementation. Children often present with end-stage disease. The focus should be shifted to active case finding at primary health care level. Clinic staff are often reluctant to initiate children on ARVs, most probably because of inadequate training and the large number of adults requiring care. Support for clinics in this regard should be urgently addressed. The guidelines should be augmented by greater emphasis on prevention strategies. Prevention of infections (such as pneumonia, tuberculosis, HBV and HPV) through treatment or vaccination should be addressed along with discussion of screening protocols for cervical carcinoma. Specific prevention of HIV transmission deserves attention i.e. condoms, circumcision, microbiocides and ART. Prevention of drug toxicity and drug interactions and contra-indications also require more space. Disclaimer. The opinions expressed in this paper are those of the authors and do not represent the views of government, industry or any NGO. Conflicts of interest. No authors have any conflict of interest to declare. Dr Spencer received honoraria from Aspen, Adcock Ingram, GSK and MSD in the past 12 months. Participants. Professors Sharon Cassol and Maureen Taylor; Drs Lynne Webber, Francis Akpan, Andy Beke, Masese Beke, Mariette Botes, Sheila Bowyer, Marieke Brauer, Vivian Cox, Judith Dlamini, Nicollette du Plessis, Hashim Ebrahim, Marcelle Erasmus, Ute Feucht, Allison Glass, Ebrahim Hoosien, Evelyn Kangawasa, Fritz Kinkel, Sim Mayaphi, Daniël Morobadi, Rolando Viani, Marianne Swanepoel, John Sim and Adele Visser; and Messrs Glen Malherbe and Neil Morris. Theresa Rossouw is affiliated to the Department of Family Medicine, University of Pretoria; Karin Richter to the Department of Medical Virology, University of Pretoria, and the National Health Laboratory Service; Des Martin to the Department of Medical Virology, University of Pretoria, and Toga Molecular Laboratory; Theuns Avenant to the Department of Paediatrics, University of Pretoria; and David Spencer to the Toga Clinical Unit, Toga Molecular Laboratory, Johannesburg.